Staten Island, NY - The early morning death on a Staten Island highway of a prominent Los Angeles rabbi appears to be a tragic accident, according to the NYPD. Police said that 72 year old Rabbi Dovid Grossman was traveling north on the Staten Island Expressway early this morning when he began having difficulty with his vehicle. Investigators from the NYPD’s Collision Investigation Squad who spent the morning at the accident scene near the Victory Boulevard exit said that Rabbi Grossman’s vehicle was parked on the right shoulder of the highway and had a flat front right tire. The 2017 Ford Fusion, which appears to be a rented car, had its emergency lights flashing and was partially blocking the right lane of the highway when it was struck by a 2005 Honda being driven by a 43 year old woman at approximately 4 AM. The force of the collision sent Rabbi Grossman’s vehicle across all three lanes of the expressway where it struck the center median. Paramedics arriving on scene found Rabbi Grossman unconscious with head trauma and he was transported to Staten Island University Hospital where he was later pronounced dead. The driver of the Honda sustained minor injuries to her right hand and was taken to Richmond County Medical Center. Both drivers were alone in their vehicles when the accident occurred and police said that neither showed any signs of impairment. 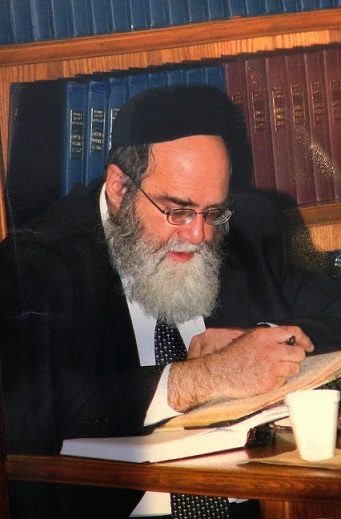 Rabbi Grossman was the rosh yeshiva of Yeshivas Hachaim of Los Angeles and was well known for his Daf Yomi shiurim which are available online and cover all of Shas. Baruch Dayan Emes. He was a tremendous tzadik and Talmud Chachom muflag. He will be missed. If a person gets a flat on a dangerous part of the highway please call 911 and never leave the vehicle until an officer has arrived! Boroch Dayan Emes! Nebach, this was a very tragic accident. #1- You mentioned that motorists should stay in their car; sometimes, it is better to wait outside the car, away from traffic, if there is the danger of being rear ended. In 2015, I was attempting to exit the Belt Parkway, at Flatbush Avenue, going North. A useless city maintenance crew was blocking the exit, and didn't appear to be doing anything constructive. There was absolutely no warning prior to that exit that it was closed. During that brief period, I was concerned about being rear ended by someone who also wanted to exit, but had no idea that the exit was closed. Finally, I was able to safely get out of there, exit at Flatbush Avenue going South, and turn around. I complained to the office of our esteemed Mayor Del Blasio, twice. To this date, over 2.5 years later, I've never received a response. His predecessor would have definitely responsed! Any information where the family will be sitting? at the home of Rebetzin Rokowsky 41 Freedom Dr. Lakewood, NJ 08701. Exact times will be updated.